Sorry for being quiet for a bit but it’s been very busy! Where do I begin? 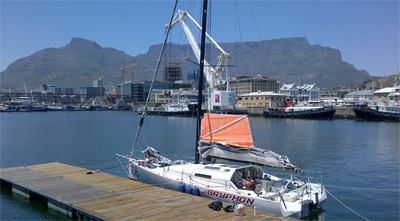 Came into Cape Town on Monday night- after a wild sail up the coast from the Cape of Good Hope. The coastline is spectacular and a strong wind from the Southeast took me up the shore in no time- arrived in Table Bay about midnight and Harbormaster Steven Bentley came out in a RIB to guide me in to Victoria Basin in 35 knots of wind in Table Bay. Very glad to get to the dock. Yesterday was incredibly busy. We replaced the converter box for the hydro-generators and that went well. We went for a sail/sea trial to test them in Table Bay where it always seems to be blowing 35k and everything worked well. I am very psyched to have my hydros back in action! However... I had been having trouble with my alternator/regulator for charging the batteries while running the engine- so the technician finally determined that the problem was in the alternator- so we pulled it out of the boat and took it to a repair shop for new brushes and diodes. I hope to get it back today and re-install and test- but not sure on the time table. I found that the solent jib had significant chafe so had to take the sail down and do a fairly large repair on the dock. Lots of helpers- which was great. Sail is now back on the boat and ready to go. Thank you to Terry Halpin for getting your pal Mike to help me- a very knowledgeable guy. My old high school pal Peter Claypool lives and works here in Cape Town and has been a huge help- it has been very nice to have an old friend here for moral support. We had a great dinner last night and he is helping me round up supplies. Thank you, Clay. Filled up with diesel and fresh water- now off to the grocery store for a few things- hope to depart tonight- but may be tomorrow. Although very tempting to stay here in beautiful Cape Town with people could not be more helpful and friendly. Hope a weather window opens so I can get south quickly. So that’s about it- I got a very nice note from my German competitor Henrik who broke his ankle and had to stop his voyage. He also pulled in here to Cape Town and was quickly flown back to Germany for surgery. His boat is the marina just down the road. Best wishes to you Henrik for a speedy recovery- I will be continuing my voyage with you and mind- hope I can make it around for both of us.